The candidate with the more popular name — in the year of the election — won only 15 times out of 33. Ten of the winners with the more popular name were Republicans. Ten of the 18 winners with the less popular name were Democrats. The Democrat had the less popular name in 20 of the 33 elections. The moral of the story: It is a slight disadvantage to have a popular name. Democrats are more likely than Republicans to have weird names. This latter tendency confers a slight advantage on Democrat candidates. But Mitt — like Grover, Woodrow, and Calvin — is the name in the political arena. And I have no reason to believe that Mitt is any more popular than Barack. If Barack is the less-popular name, that might count as an advantage for Obama. But a less-than-dismal performance in a debate would do him more good than his weird name. * Restricted to the top 1,000 boys’ names and the top 1,000 girls’ names in each year. ** All of them Republicans and Democrats, except in 1912, when Theodore Roosevelt ran on the Progressive ticket and was the runner-up to Woodrow Wilson. *** It does not seem that presidents’ first names become more popular during their time in office. The rank of Grover (Cleveland) went from 20 in 1884 (when Cleveland was first elected) to 47 in 1892 (the year of Cleveland’s second victory). Benjamin (Harrison) dropped from 25 in 1888 to 42 in 1892. Woodrow (Wilson) barely budged, going from 192 in 1912 to 190th in 1916. Herbert (Hoover) was 25 in 1928 and 44 in 1932 (another victim of the Great Depression, no doubt). Franklin (Roosevelt) went from 66 to 65 to 87 to 112 (in 1932, 1936, 1940, and 1944, respectively). Dwight (Eisenhower) was 123 in 1952 and 139 in 1956. (And, lest you think that Dwight should have been a Democrat, remember that his opponent was the more weirdly named Adlai — or Adelaide, as some wags called him.) Richard (Nixon) fell from 8 in 1968 to 14 in 1972 (and, unsurprisingly, kept falling steadily thereafter, to 127 in 2010-2011). Ronald (Reagan) went from 58 in 1980 to 67 in 1984. George (Bush I and II) declined from 78 (1988) to 95 (1992) to 130 (2000) to 146 (2004). George has come a long way (down) since Washington was first in the hearts of his countrymen. On average, the top 20 male names of 1880 dropped at least 220 places from 1880 to 2011; whereas, the top 20 male names of 2011 rose at least 271 places, on average. Female names are far more volatile: On average, names among the top 20 in 1880 were ranked at least 418 places lower in 2011; whereas, the top 20 in 2011 rose at least 457 places, on average. 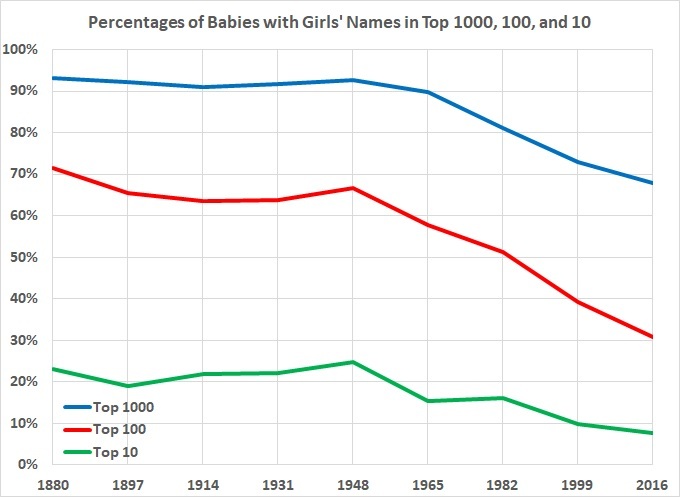 The greater volatility of females names is also indicated by the number of them that are not in the top 1000 in both 1880 and 2011, namely, twelve. Only four of the male names are not in the top 1000 in both years. The popular female names of 2011 tend to be more euphonious than their counterparts of 1880. I do not miss Minnie, Ida (curt), Bertha, Florence, or Nellie — though I do miss Carrie. On the other hand, we have the ersatz Madison, and unisex-sounding Addison, and two names that once were almost exclusively assigned to males: Avery and Aubrey. I do hope that the trend toward the feminization of male names does not extend to Homer, Humphrey, and Oscar. In the table below, I offer a morsel of cultural history. 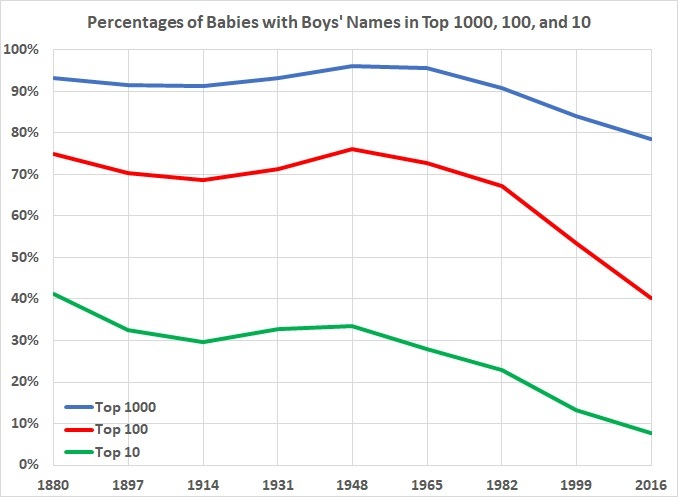 The table compares the popularity of baby names in 1940 (the modal birth year of members of my high-school graduating class) with the popularity of the same names in 2011. Also shown are the names that have replaced the names of my classmates in popularity. Michael, for example, is number 6 in 2011, replacing Charles, the number 6 of 1940. Michael, as it happens, was number 18 in 1940. As might be expected, the turnover among female names is greater than the turnover among male names. 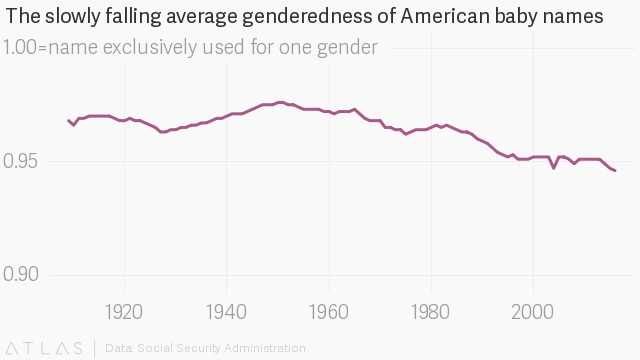 For example, 6 of 40 male names dropped out of the top 1000 between 1940 and 2011, as against 20 of 39 female names. And 11 of 40 replacement names for males were not in the top 1000 in 1940, as against 21 of the 39 replacement female names. Source: This search tool at the website of the Social Security Administration.